Garage doors now come with a wide range of options, and we understand that our customers want the very best. 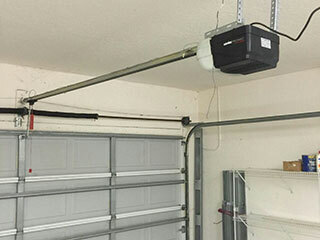 We're happy to work with you to decide what kind of garage door opener will be best suited for your needs, and to make sure that it gets installed correctly. The type of door you have will determine what kind of opener you'll need in order to maintain proper operation. The heavier the door, the higher output of horsepower its opener needs to be able to produce. The different models of garage door openers we offer our customers are of the highest quality, and any installation performed by one of our trained professionals is guaranteed to satisfy our customers. Some units even come with backup battery features, which can allow them to continue to work without power for a few hours. This is a great asset to have during unexpected power outages, which is another thing to consider when deciding on a model to get. Your budgetary needs, as well as several other constraints, such as your garage's infrastructure and weather conditions in your area, are also a few of the main factors you will need to contemplate. The drive mechanism in your opener is something homeowners often neglect to consider. From the silent operation of the belt drive models to the more rattily chain drives, the noise there components can produce (or avoid producing) varies from model to model. While it may seem overwhelming to choose a new opener for your home, our experts are more than happy to help you make this decision. Call today, to have one of our Garage Door Repair Corona professionals help make that choice easier for you, or for any other opener related issue you might be experiencing. Your salvation is a phone call away.